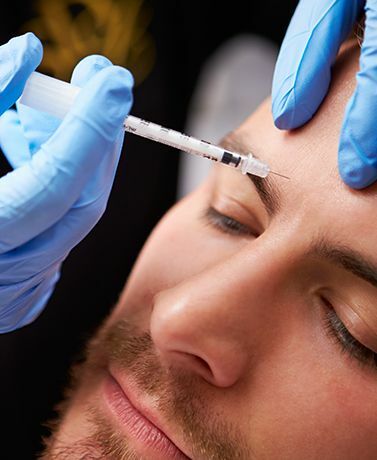 BOTOX® Cosmetic is prescription medicine a medical professional injects into muscles to temporarily improve the look of both moderate to severe crow’s feet lines and frown lines between the eyebrows in adults. Tell your doctor about all your muscle or nerve conditions, such as amyotrophic lateral sclerosis (Lou Gehrig’s disease), myasthenia gravis, or Lambert-Eaton syndrome, as you may be at increased risk of serious side effects. Tell your doctor if you have or have had bleeding issues; plan to or have had surgery; have forehead muscle weakness such as trouble raising your eyebrows; drooping eyelids; or any changes to your face. Tell your doctor if you are pregnant, plan to become pregnant, are breastfeeding or plan to breast feed. It is not known if BOTOX® Cosmetic can harm your unborn baby or if BOTOX® Cosmetic passes into breast milk. The most common side effects include temporary injection site pain; weakening of adjacent facial muscles; drooping eyelids; swelling eyelids; and headache. Other side effects, while less common, have been reported including blurred vision, double vision and allergic reactions (itching, rash, red itchy welts, wheezing, asthma symptoms, dizziness or feeling faint). These are not all of the possible side effects. Call your doctor for medical advice if you experience any side effects after treatment with BOTOX® Cosmetic. What Should I tell My Doctor About Medicines and Vitamins I Take? Using BOTOX® Cosmetic with certain medicines may cause serious side effects. Do not start any new medicines until you have told your doctor that you have received BOTOX® Cosmetic in the past. Tell your doctor if you have received an injection with another botulinum toxin product in the last 4 months, such as Myobloc®, Dysport®, or Xeomin®. Be sure your doctor knows which product you received. Tell your doctor about all prescription and over-the-counter medicines and supplements you take including: vitamins and herbal products; recent antibiotic injections; anticholinergics; muscle relaxants; allergy or cold medicine; sleep medicine; aspirin-like products; and blood thinners. Ask your doctor if you are not sure whether your medicine is listed above.